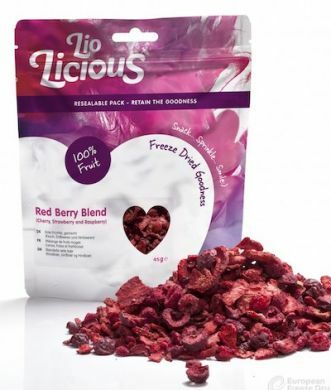 A mix of freeze dried raspberries, cherries and strawberry pieces. Retains all the flavour of the fresh fruit - but because they are freeze-dried they don't need to be refrigerated and can be stored at ambient temperatures unopened for many months or for up to 2 weeks once opened. Ideal for adding as a topping to desserts or cocktails - they can be used in their dried state or soak briefly in water and re-hydrated. 100% pure fruit - free from preservatives, colours or flavourings. Can be eaten direct from the packet as a snack. Ideal as a topping on sweet or savoury dishes. Can we rehydrated for use in fruit salads or drinks. Will naturally re-hydrate if added to wet foods. 45g of freeze-dried red berries is the equivalent of 720g of red berries. Just the water is taken away. Frozen foods retain fresh flavor and nutritional value, but require uniform, low temperature storage conditions. Dehydrated and canned foods are shelf-stable, but high-temperature processing can degrade flavour, texture and nutritional content. Freeze-drying combines the best of these processing methods. It preserves freshness, color and aroma similar to frozen food, while providing the shelf-stable convenience of canned or dehydrated food. Freeze-dried foods, like frozen, retain virtually all their fresh-food taste and nutritional content. Freeze-drying removes the water, not the flavor. Freeze-dried foods maintain their original shape and texture, unlike dehydrated foods, which shrink and shrivel due to high-temperature processing. Freeze-drying removes water under low temperatures (typically -50C), which keeps intact the moisture channels and food fibers. Just add water, and in minutes every fresh food detail returns. Freeze-dried foods have 98% of their water removed. This reduces the food's weight by approximately 90%, making it easier to handle and less costly to ship. For example, twenty-five pounds of celery weigh only one pound after freeze-drying. Freeze-dried foods can be stored at room temperature, without deterioration or spoilage. This is because freeze-drying and packaging remove both water and oxygen – the two primary causes of food deterioration. Lio-Licous is a brand of American company, Oregon Freeze Dry Foods, the world’s largest custom processor of freeze dried products. Incorporated in 1963, OFD Foods began as a supplier of dried fruit for breakfast cereals and later worked with the Department of Defense to develop and produce freeze dried military rations. In the early 1970’s, the company began marketing its own Mountain House line of freeze-dried foods for outdoor recreational use. In the 1990’s OFD Foods moved into the drying of chemicals, pharmaceuticals, and biological materials. Today, OFD Foods is the world’s technological leader in freeze-drying. Our freeze-dried ingredients are key components in the products of some of America’s largest food companies. We’re still a major supplier to the military, and our Mountain House brand continues to be the favorite of backpackers and campers. Oregon Freeze Dry’s subsidiary in Europe, European Freeze Dry (United Kingdom and Denmark), is the UK’s largest freeze dryer, and is both ISO 9002 and HACCP certified. Raspberries, Cherries and Strawberries. No added sugar or any other preservatives. Manufactured in a 100% peanut/nut free facility. For best results, we recommend the pouches be stored unopened in a cool dry area. 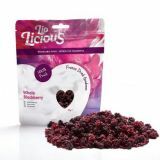 Once opened, we advise that you store your Lio-Licious product in an air tight container within 2 weeks. Use as required by recipe either in dried state or soak briefly in water to re-hydrate.